Looking for the perfect unique octopus animal napkin ring gift idea for the octopus lover? Our set of 4 elegant hand sculptured and painted napkin rings make the unique gift for the "hard to shop" relative, friend, or business associate. The napkin ring detail is truly a work of art. Use Koyal napkin rings in various event themes from rustic to modern to vintage. Koyal napkin rings are ideal to use for weddings, baby showers, bridal shower, rehearsal dinner parties, graduation, Easter, Thanksgiving, and Christmas gatherings. Our gold napkin rings make the perfect 25th anniversary gift idea and our gold napkin ring designs are a unique 50th anniversary gift idea. Buy in bulk napkin rings for large gatherings. Koyal octopus animal napkin rings are the perfect gift for Mother's Day, Father's Day, girlfriend, boyfriend, coworker, best friend, teacher, wedding couple, recent college graduate, or friend who loves to entertain at home or in the apartment. These are the perfect home décor detail for the octopus lover who already has the perfect napkin holder and napkin folding technique mastered. 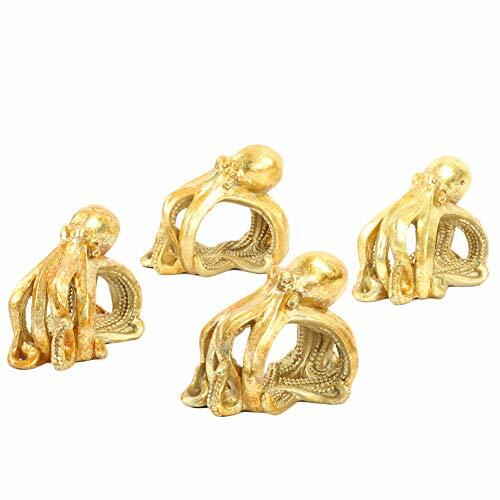 MATERIAL: Hand sculptured with quality resin. Each resin figurine napkin ring is hand-painted. SIZE: 3.75 inch long x 1.5 inch wide x 3 inch height. The oval shaped opening measures 2 x 1.5 inch. Fits linen napkin, cloth napkin or disposable napkins. USE for Weddings, baby showers, bridal shower, rehearsal dinner parties, graduation, Easter, Thanksgiving, and Christmas gatherings. GIFT IDEAS perfect gift for Mother's Day, Father's Day, girlfriend, boyfriend, coworker, best friend, teacher, wedding couple, recent college graduate, or friend who loves to entertain at home or in the apartment.